This works for my Debian; it may be different for you. In Debian, you can also run dpkg-reconfigure -plow console-setup to be prompted for the various console settings and pick them from menus. Edit - I put together a small page how to setup the font colors. The section that is relevant for this post has the header "the Linux VTs" (= ttys, or "console"). If you want to use nearly any X-compatible font you should have a look at David Herrman's work on kmscon. The name slightly belies the project, actually, as Kernel Mode Setting is not a requirement for it to work - it also works with with frame-buffer devices - for instance if you are using proprietary AMD or nvidia display drivers. With kmscon you get multi-seat session management, xterm like keyboard and UTF-8 font handling and session control. Changing the font can be done via the /etc/kmscon/kmscon.conf or via a command-line option. /etc/default/console-setup et al. have been superseded on systemd operating systems, although you will find that some operating systems such as Debian try to maintain the older configuration system. The way to do this on a systemd operating system is to edit the font settings in the /etc/vconsole.conf file. These settings are applied by the systemd-vconsole-setup service, which is essentially a glorified way of running setfont and loadkeys before the login services are brought up. So you would have FONT=Uni2-Terminus28x14 in that file, for example. Note that the service program allows kernel command-line options such as vconsole.font to override /etc/vconsole.conf contents. If you are mucking around with GRUB kernel command-line options, bear this in mind. Lennart Poettering et al.. vconsole.conf. systemd manual pages. FreeDesktop.org. Lennart Poettering et al.. systemd-vconsole-setup. systemd manual pages. FreeDesktop.org. Now when selected Ctrl+Alt+F1 through Ctrl+Alt+F6 and get nice big fonts. Prior to changes I couldn't read the screen on HDPI monitor. Right click anywhere in the black space. Put a tic in "custom font" box. Click on the big text sample box next to it. Choose whatever font size and type you want. The changes will appear immediately. Not the answer you're looking for? Browse other questions tagged console tty fonts or ask your own question. How can I set the TTY font size manually in Lubuntu? Letters tty terminal text mode are very small in debian. How to increase? How do I increase the font size of the CentOS 7 console? How can I configure /etc/kmscon/kmscon.conf to use specific a) font and b) keyboard layout? Is changing background color in unix through .profile is possible? 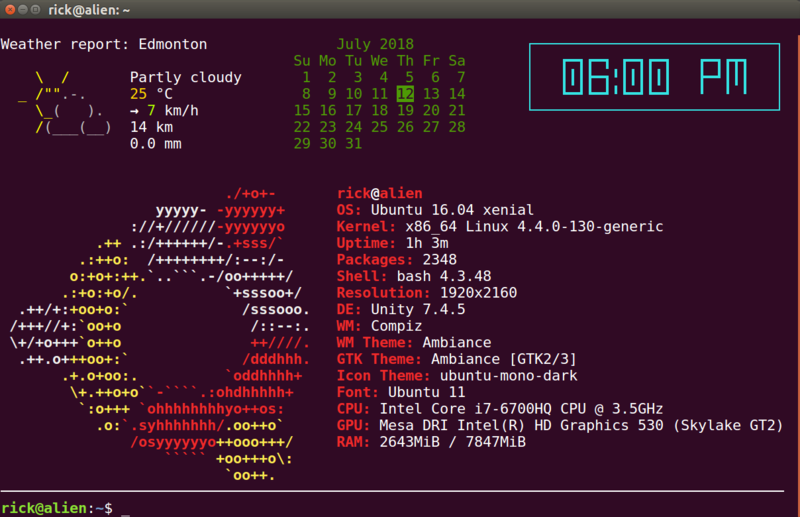 Ubuntu Server, set terminal font to a custom ttf font? Which font i am using in terminal?